Home > Product & Reviews > Footwear > Combat Boots ~ Are Your Feet Prepared For Action? Feet becoming injured can affect your operational readiness, delaying action and taking you out of the field, writes Simon Ash, UK Sales Manager at HAIX. It’s important not to take our feet for granted. Foot problems are common, sometimes caused by physical training, strain and wearing inadequate, unsuitable footwear. The boots we train in need to be comfortable to ensure when your unit is deployed you are able to walk, run, climb and perform your duties without injury. 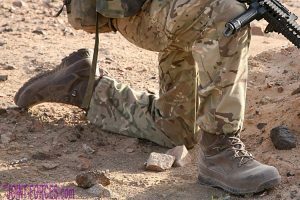 Military boots in particular are often associated with discomfort and injury; however, being selective with your boots can offer some much welcomed foot support, keeping your feet in tip-top shape and saving you from foot related-injury. Foot injury and pain is not only a massive hindrance to morale, but can also lead to long-term conditions such as musculoskeletal injury, like lower limb disorders and back pain. Musculoskeletal disorders (MSDs) are injuries and disorders that affect human movement. Many of us do not realise, but MSDs are one of the most frequent factors that affects soldiers and their physical capability for duty. It is important to invest in boots that have superior cushioning technology, construction materials and design, which will help to decrease the harmful effects of impact-related stresses when the foot strikes the ground. Military operations and high intensity training programmes are harsh on feet and contribute to a large proportion of injuries sustained. 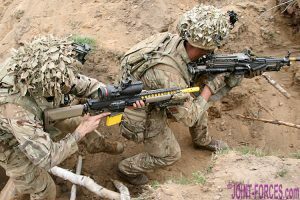 In particular, heavy load carriage and training are commonly named as factors that cause musculoskeletal injury within the military forces. As we all know: prevention is better than cure, so, what should you be looking for in your combat boots? 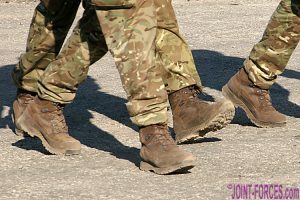 The right fit: Finding the right fit for your boots is key to preventing military operations becoming disrupted by poor foot health such as blisters, calluses and corns. When wearing your military boots ahead of any training exercise, ensure your boot’s heel is sitting tightly to the rear of the foot to give toes the needed wiggle room up front. Make sure you lace your boots properly, if your foot is sliding around during vigorous training friction will appear, which can lead to nasty blisters. However, if your boots are too tight your toes can become curled and squished leading to unwanted foot pain during military exercises. Comfort is key: Avoid musculoskeletal injury with supportive footwear. Research shows that altering your footwear may have a significant effect on injury in the lower limb. Features such as a layer of PU foam cushion your step as you go to reduce pressure on joints and back whilst providing insulation against the heat and cold. Modern sustainable materials: Boots that incorporate modern sustainable materials in the interior lining of boots will help prevent blisters and soft-tissue injury by reducing friction and pressure. High quality leather used in the outer material will provide a fibre structure meaning the boot will be durable while protecting your feet. Protection: You need to choose boots that incorporate the right safety features such as slip resistance, protective toecaps and that are waterproof and breathable. Boots with special lacing systems mould the shoe to the foot to provide a great individual fit whilst keeping your foot structure secure. Temperature control: It is worth investing in boots that have a climatic control system that regulates foot temperature. The ideal foot temperature should be regulated to between 28-32 degrees, even during periods of physical activity, such as training. Cold and damp feet can lead to swelling, soreness, blisters and in some extreme cases infections, so it is essential that your boots are able to provide the waterproofing and breathability for this. If you are injured, get the help you need. Consult your unit medical officer, GP, or physiotherapist if you have pain or concerns about your feet. 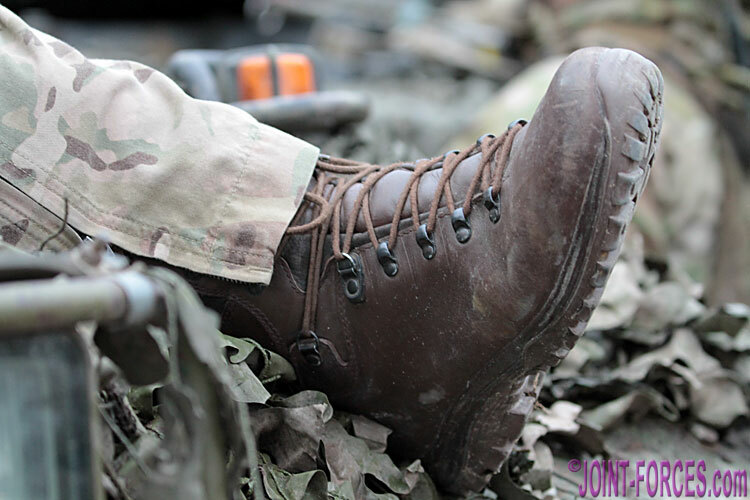 Investing in sustainable and supportive combat boots will help you stay in the field, ready for action whilst keeping injury at bay. We at HAIX are committed to developing functional features in military combat boots to meet end user demand whilst reducing health issues. HAIX combat boots are designed with a perfect combination of cushioning and support to reduce strain on the back and joints, providing optimum support and comfort for the entire working day.